“I think the garden brings the people together. Friends I didn’t have, I have now,” explained Anita, an Elder who participated in Elsipogtog First Nation’s new community garden this summer. 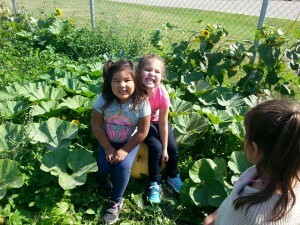 In partnership with Canadian Feed The Children (CFTC), Elsipogtog First Nation School expanded their school garden this year into a full initiative open to all 3,000 community members. The garden quickly became a treasured meeting space for community members of all ages – elders, parents, teenagers and children gathered together to help ensure its success. Elsipogtog First Nation is a vibrant community in New Brunswick with which CFTC has been working in partnership to help address the significant food security challenges they face. Like many First Nations communities in Canada, the loss of land rights, erosion of traditional practices, broken generational links of knowledge, and systematic discrimination towards Indigenous people have led many families to struggle with poverty and hunger. More than half of all Elsipogtog First Nation School students reported going to bed hungry at night. CFTC works with local First Nations’ leaders to ensure traditional practices and narratives are integrated into school nutrition and food programs, along with encouraging inter-generational experiences to support the transfer of once-lost knowledge between Elders and youth. In support of this approach, the school garden was expanded into a community garden and a coordinator was hired for the summer to help provide the community with education sessions, volunteer coordination, maintenance, harvest and garden feast planning. As the garden grew, so too did the community around it. Watering and weeding took place alongside socializing and shared tea. Elders, parents, and youth came together to learn and work together, bridging the generational divide that is sometimes difficult to overcome. When someone thought a plant was ‘just a weed,’ an Elder was able to teach its use as a traditional medicine. Recent graduates from the Elsipogtog First Nation School helped build a rainwater collection system for the garden, and local teenagers helped build the Elders raised garden beds. The community celebrated birthdays, had garden parties, and enjoyed barbecue potlucks. CFTC’s New Brunswick Program Advisor Cheyenne Mary explained: “The garden becomes a safe space for people to go, because it’s not a classroom with four walls, a ceiling and a floor. 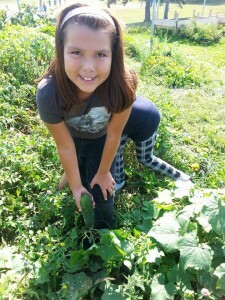 It really enables them to connect to their culture.” By mobilizing the community, the garden has helped empower Elsipogtog First Nation to address their food insecurity challenges using culturally-meaningful solutions. The garden went beyond the community plot. Community members were encouraged to start their own home gardens too. A tiller that had been purchased for the garden was used in a tilling lending program. More than a dozen home gardens were tilled this summer alone. Joan believes the garden has sparked a change in her community: “I think it has given incentive to most people who have come to the garden, or who even have heard about it. Now they know gardening is achievable, and they’re enjoying it,” she explained. 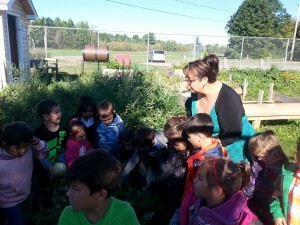 When the Elsipogtog First Nation School students returned to school this past September, they saw that the seeds that they had planted in class in the spring had grown into a thriving, healthy garden because of their community members’ stewardship and hard work. The children of Elsipogtog inherited much more than the produce ready for harvest for their lunch meals – they also inherited the love, care, and dedication exemplified by their Elders and strong network of community members who help tend to them too, while they grow.